Photo: Ainsworth E. Blunt House, ca. 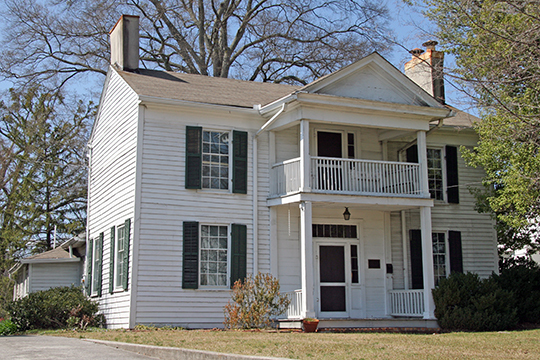 1848, 506 South Thornton Avenue, Dalton, GA. Listed on the National Register of Historic Places in 1980. Photographed by User:GamblinMonkey (own work), 2008, [cc-by-1.0 (creativecommons.org/publicdomain/zero/1.0/deed.en)], via Wikimedia Commons, accessed September, 2015. Whitfield County administrative offices are located at 301 West Crawford Street, Dalton, GA 30720; phone: 706-275-7500. Whitfield County  was established on December 30, 1851 by the Georgia General Assembly. The county was named for George Whitefield, a minister in the Church of England who settled in Georgia in 1738. Whitfield County had a 2007 estimated population of 93,379 and is bounded by the Georgia-Tennessee state line to the north, Murray County to the east, Gordon County to the south and Catoosa and Walker counties to the west. Whitfield County includes the municipalities of Cohutta, Dalton, Tunnel Hill and Varnell. It also consists of numerous smaller communities that are not incorporated cities but are recognized places in the County. Mactec Engineering and Consulting for Whitfield County, City of Daloton, City of Tunnell Hill and City of Varnell, Whitfield County Comprehensive Plan 2008-2018, 2008 ,www.whitfieldcountyga.com, accessed September, 2015.